We’ve written about FunMobility’s nifty picture messaging app for the iPhone and Android, called FunMail, that allows users to blasts their text into the application, which then breaks down whatever the user typed for context and places fun graphics with your original text. Now, FunMobility has caught the Twitter bug and is launching FunTweet, a web service which turns any Twitter stream into visual messages that are related to the text. 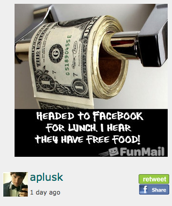 Similar to FunMail, FunTweet will turn text in Tweets into a matching image. On FunTweet’s site, you sign in with your Twitter credentials and the service will draw your Tweets from your Twitter homepage feed and display each tweet as a FunMail image on FunTweet. Users can also enter a @UserName, a HashTag or a Subject as well to the images. If you like the image FunTweet picked, you can publish the Tweet to your Twitter account. If you don’t like the image, click “Try Again” and you can choose from other images. For example, if you tweet about writing a story or reading a book, then FunTweet will come up with images that match “story” – a book, a magazine, a typewriter, or a pen. FunMobility is hoping FunTweet can be a display tool for parties, conferences and other gatherings where live stream messages may be projected. I find myself wishing I could include my own pictures into my FunTweets so I’m hoping the site will soon include that functionality. FunMail for the iPhone has gained a bit of traction in a short amount of time with 100,000 downloads since its launch in November. So FunTweet could gain a loyal following a fun tool to spice up Tweets. TwitSig and SayTweet also allow you to make images from Tweets.